Margo Boyer came down with body aches earlier this week, the day following a scheduled colonoscopy, and sending her to a local emergency room. 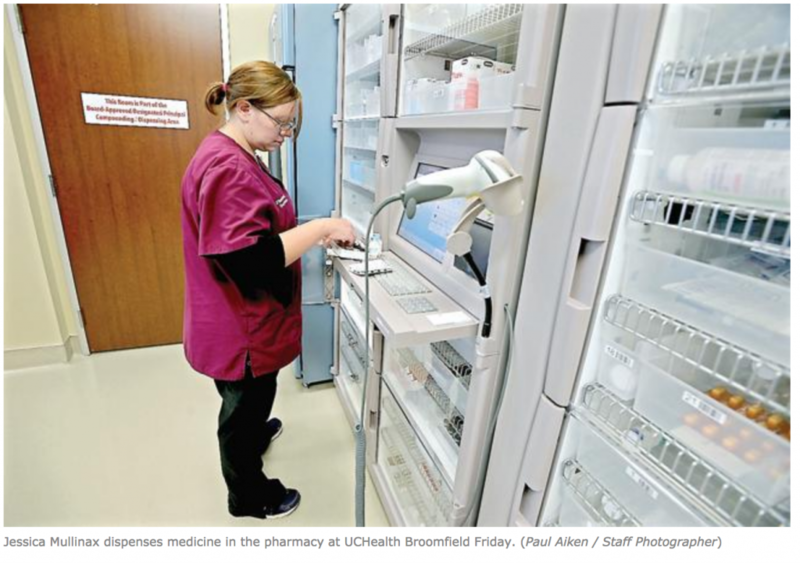 Friday she was expected to check out of UCHealth Broomfield Hospital — one of the newest hospitals in Colorado — where she was transferred after her initial emergency room visit in Longmont. The Broomfield hospital welcomed visitors Friday to showcase the facility that received full accreditation last week. Boyer’s first experience with personal health problems was drastically different than experiences helping friends and families with other hospitals. Typically emergency rooms are unpleasant, she said, with loud noises and harsh fluorescent lights. Her experience with UCHealth Broomfield was completely different. “It was all so much better than I’ve ever experienced with other people,” Boyer said. “They’re efficient and everyone’s been so pleasant.” The facility, which opened in late June, has served about 400 emergency patients and more than 30 in-house patients. There are 18 general inpatient beds and four intensive care beds right now. As the need grows, more of the building will be opened, eventually totalling 50 inpatient beds. Boyer was the only patient in the hospital’s inpatient rooms Friday. Chief Nursing Officer Jennette Bergstrom said that currently, the hospital employees 125 people and is staffed for two of the three operating rooms the hospital has. Outpatient surgery and a third floor of patient rooms and will be open in the future as the hospital grows, she said. 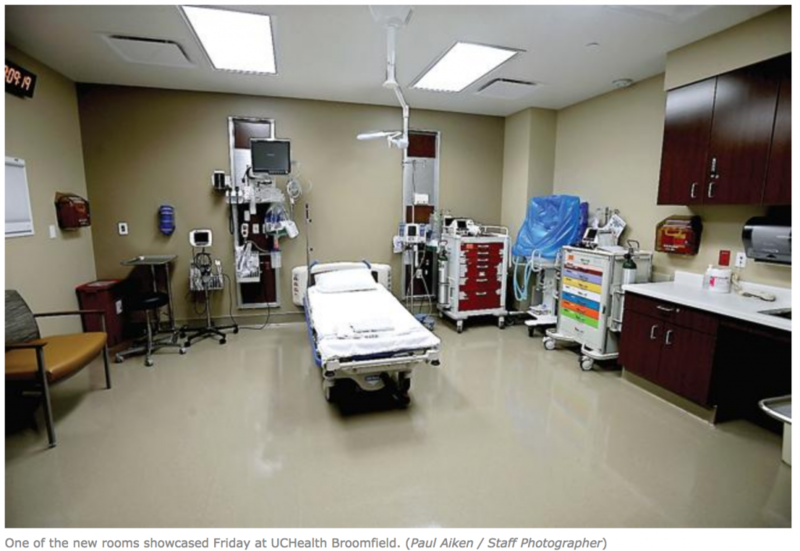 UCHealth Broomfield Hospital, at 11820 Destination Drive, broke ground late last summer. Bergstrom and Dan Weaver, hospital spokesman, stressed the community-focused care that the facility provides to the area. It’s operation helps to address Colorado’s need for improved access to emergency medical care with this new hospital and the 14 free-standing emergency rooms it connects with in the Denver Metro area. The American College of Emergency Physicians gave the state of Colorado a D+ grade for access to emergency care in 2014 on their Emergency Medicine Report Card. The report shows the need for increased access to emergency medicine, not just in Colorado, but also across the nation. Last week the Joint Commission certified the new hospital, a step that allows the freestanding ER rooms to accept Medicare, Medicaid and Tricare patients. The hospital opened with 18 private inpatient rooms, three advanced operating rooms, a four-bed intensive care unit, and the 24-hour emergency room. Lab equipment includes a 64-slice CT scanner, various carts to move medical equipment from room to room and an on-site pharmacy. The hospital is operated through a partnership with Adeptus Health, a patient-centered health care organization dedicated to expanding access to the highest quality emergency medical care. Amenities such as free wi-fi, a play area for children, a coffee station and comfortable waiting areas were installed to help patients and visitors feel welcome, Weaver added.